When it comes to toys in this day and age, if you have ever taken time to look at them, you’ll probably say to yourself “why didn’t they have toys like this when we were younger?” Seriously, there is no denying the fact that there are some pretty amazing toys out there. In fact, they’re so cool that many of us adults may find ourselves playing with them, without even realizing we are playing with a child’s toy. This year, at the toy fair, which was held in New York, we witnessed a wide array of toys being introduced. 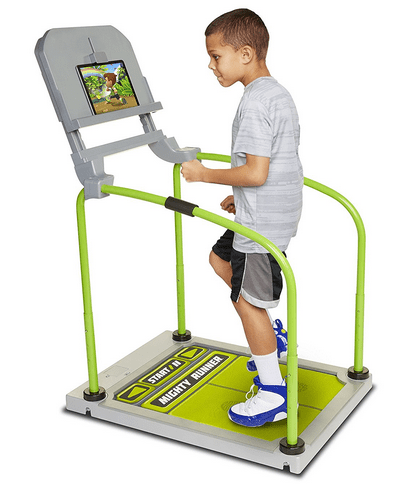 One of the toys that we would like to introduce you to today is Jakks Pacific’s Little Mighty Runner. What is the Little Mighty Runner – Mighty Gym? The Little Mighty Runner is a toy designed for kids from Jakks Pacific. This “toy” makes it possible for children to challenge themselves physically via games that pop up through the screen of a mobile device like a tablet or iPhone. Jakks Pacific’s Little Mighty Runner will be a whole lot of fun for the little ones. If you’re looking for the type of toy that will get that little one moving around, then you’re looking at it right here. The Little Might Gym will make exercising a breeze!